LA CASETA. Rural house near Barcelona With heated Pool and barbecue. 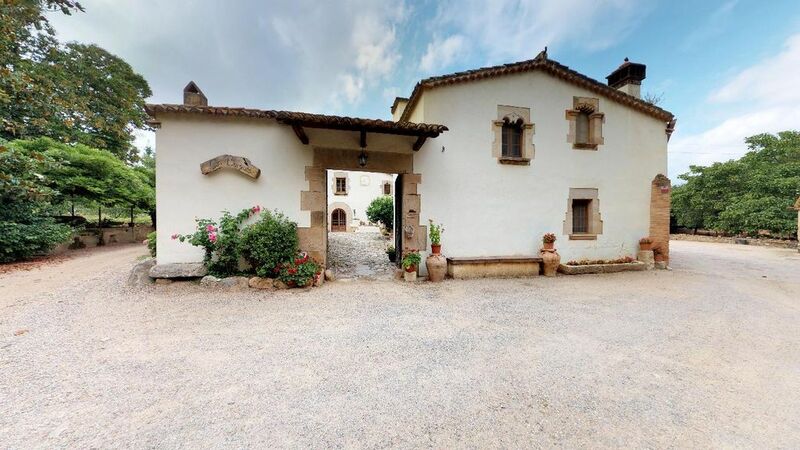 Can Burgues is a traditional Catalan farm cottage in the middle of the countryside yet only 30 minutes from Barcelona city, situated in the village of Santa Eulàlia de Ronçana. Offers easy access to main routes to all parts of the country, whilst still enjoying a peaceful and relaxing atmosphere in pleasant green countryside where you may enjoy interesting nature-walks. In the nearby area there are a number of places of historical interest well worth the visit and likewise the gastronomic selection traditional to the area offers an attractive and varied menu. We are a family of five, my wife, my three daughters and I. I live on a big farm and I work as a farmer raising hazelnuts, besides the tourism business. I have been working with the holiday cottage for 15 years already. We started with only one apartment and after some years we decided to increase it because we thought it could be worth it, and we saw that working on this business has brought us into contact with such a great families from around the world. My family and I host the customers, and we all want the people to feel as home and as comfortable as possible. I like to talk with the guests and enlighten them about the country and the region. I also like to show them the house, the fields and the surroundings of the house because it is an old farm house with a long history. Why this location? Can Burgues dating back to the 13th century, to this day has always been handed-down from father to son remaining in the family. Today it still retains its original structure and rustic style. Can Burguès is near all main routes of all points in the country and very close to the main cities, but it is situated in a quiet and rural area, therefore is the best place to enjoy a peaceful and relaxing atmosphere in a pleasant green country-side where you may appreciate interesting nature-walks, and spend your free time in an enjoyable and interesting way. Our guests will have a quite and relaxing time at the sauna and the pool, which is heated from March to November, while enjoying the nice weather. We give them their space and freedom, but we are also available at any time if needed. Full bathroom and toilet. Included bath towels. In the village there is a beautiful walking route next to the river. Lounge/diningroom with fireplace and TV. Modern kitchen with cooker, fridge, oven, microwave and dishwasher. There is also a washing machine. Full kitchen. The surrounding facilities include a beautiful garden, children’s’ play area with swings and other games, ping pong, pool table, and bicycles for the guests’ enjoyment. We have kid bikes available for free. The heated outdoor pool is private but shared with the guests of two more apartments. Notes on accommodation: Special consideration has been given to the furniture and decoration so that your stay will be pleasant and comfortable. Inside: The house is fully equipped: the kitchen, the dining room and the rooms have everything you need for a good and comfortable holidays. The house includes bed sheets and bath towels. Outside: Around the house there is a very beautiful garden to enjoy. There are also a sauna, a swimming pool (it's heated from March to November), with deck chairs, where you will be able to relax and enjoy the sun. Next to it the is the barbeque area and a ping pong room. Children can be entertained in the playground with swings. There are also bikes available any time to go for a ride to the surroundings. The pool and barbecue area is shared with the guests of another two apartments. It is a very large area and quiet atmosphere. It's ideal for children who play with each other and can make new friends. This home was more than we expected. We came to see our daughter that plays basketball for a couple of towns over. The location was 10 minutes drive to her location and 30 minutes to Barcelona. The accommodations were almost complete, missing a bathtub for my granddaughter, but she handled the shower just fine. The home was very roomy for the 5 of us. We took advantage of the grounds it was located on. The sauna, pool and walks in the garden. The feeding of the pig and seeing the bunnies and the chickens. Most importantly the playground for our girl. It is a peaceful place, yet close to the city. We are so very pleased with the overall rental. Thank you Josep. We loved our stay. It has been one of the most amazing places we stayed at as a family. Property is amazing, hosts are amazing, you will love being in the tranquility of the countryside. This secluded property was perfect for a very relaxing holiday, within travelling distance to explore the sights of Barcelona. The house was immaculate, the pool and the facilities in the house were great and Josep and his family very helpful. Our children had a great time in the pool and playing table tennis while having the free wifi was an added bonus. The little village was good with friendly local shops, and we ate out once in the burger restaurant which was nice. Definitely worth a visit! We have been very pleased with your stay with us. Had a lovely stay in a great place-kids had a lot more freedom than at home-cycling around the farm area on the bikes provided there-lovely BBQ area and heated pool so lots of chilled out days.A few good places to eat on the surrounding area too and Barcelona not too far away to visit.Will return. We stayed with our 3 children (17,15&11) over the Easter holidays and have banked some wonderful family memories from our time on this charming nut farm. Josep the owner was the most generous and attentive host you could ask for. The outdoor facilities are great and the pool area a particular feature with the heated pool and a super outside dining area. We made the most of this, cooking over a wood BBQ most evenings. A Spanish family staying in a neighbouring apartment even showed us how to cook 'calcuts' on the BBQ. The accommodation itself is clean but simple and being a period building the windows are small which makes for a cooler but darker interior. If you were staying indoors this might be a bigger consideration but given the outdoor space and generally good weather this is a minor consideration. The farm is in the centre of a small urban community with a through road but you are not conscious of this when you are there as it is an oasis of calm. The central position means there are shops and a simple selection of eateries within a few minutes walk and a community building where my son and I watched Barcelona narrowly lose 2:1 to Real Madrid surrounded by a couple of hundred very friendly Catalonians. (Even if like us rather miffed by the scoreline). The farm lies within 35 minutes drive of the city but a few days we got caught in rush hour traffic which made the journey much longer including an agonising and nail biting journey back to the airport. To anyone living near a major city this is standard fair and in reality Barcelona is an easy city to visit by car with numerous and relatively inexpensive underground car parks. We visited several of the best known sites but the favourite was the lesser known St Pau hospital which we thought was great value and probably under visited given the breathtaking art nouveau architecture. As I said in the header all in all some wonderful family memories. Thank you Josep for your kindness and generosity, we will be back. - Barcelona airport is 45 minutes away. - Girona Airport is at 55 minutes. - Barcelona city, 30 minutes. - The Catalunya Grand Prix Circuit, 15 minutes. - Montseny mountain natural park, 1 hour. - The ancient Monastery, Sant Miquel del Fai, 30 minutes. - Thermal mineral-water baths at Caldes de Montbui, 10 minutes. - Modernism architecture in La Garriga, 15 minutes. - Ski stations in the Pyrenees mountains, 2 hours. - Theme park Port aventura 1,5 hours. You can enjoy pleasant walks and bike-rides in the locality, and if you wish you may visit the farm and participate in the farm work. All services are available nearby in the village, 5 minutes on foot. Changeover Day: In the high season the changeover day is Saturday. Chek in at 3pm. Chek out at 10am Medium and low season we can be flexible.